I have had both PRK and LASIK performed on both of my eyes and I hope that my experiences will be helpful to anyone who is considering having either procedure performed. In June and September of 1996 I had my near-sightedness (mypoia) fixed by a laser surgery procedure called PRK (photorefractive keratectomy). This was something I dreamed of doing for myself when I first heard about it ten years before. One day I heard a radio commercial for Cambridge Eye Doctors and their LaserVision Correction service. I immediately went into my local Cambridge Eye store and signed up! Now, of course, it isn't quite as simple as just signing up. You have to be approved for the surgery. Not everyone is a good candidate. First, your eyesight has to be bad enough but not too bad. Furthermore, you can't have more than a certain amount of astigmatism, and your prescription can't have changed in the last year. There were also the usual general health requirements (no pregnancy, heart conditions, etc.). I was a perfect candidate because my vision was -3.5 diopters/-4.0 diopters with only a tiny bit of astigmatism in the left eye. My prescription hadn't changed in four years, I was only 31 years old, in good health, and eager to do it. I also had the funds. You see, this procedure is elective surgery, so no health plan will cover it. At $1500 per eye, it can be expensive. But the cost covers all the eye drops and check-ups over the course of a year while they monitor the healing process of your eyes (more on that later). The process can be broken down into three phases: pre-operative exam, the laser surgery itself, and post-operative care. The pre-op exam is done only once, but the surgery and post-op care has to be endured separately for each eye. Since they usually only do one eye at a time, making you wait three months in between while they monitor your eye's reaction to the surgery, the whole experience is a six-month oddysey. Pre-Op Exam: On the Wednesday before surgery I went to Mass Eye and Ear in Boston for the pre-operative exam. The primary purpose of this exam is to get a computer-generated topographical "map" of your eyes. The information gathered at this time is used by the surgeon to configure the laser to precisely match the needs of your eyes. I spent about two hours going through all the steps, some of that time being spent waiting for some special eye drops to properly dilate my eyes. These eye drops keep the eyes dilated for most of the day after you leave so I was told to bring sun glasses. It also becomes difficult to focus on things when your eyes are completely dilated. Driving home after the pre-op exam was a bit tricky but not perilous. PRK Surgery: My surgery day was Friday, probably the most common day of the week for it. This gives you the weekend to recover somewhat before having to return to work. I went back to ME&E and waited for my turn. Others were sitting waiting to go under the laser and I could see that they were a bit nervous. I was completely relaxed, and in fact, I was really excited and eager to get in there. The Valium tablet they gave me to keep me calm throughout the procedure probably wasn't terribly necessary in my case. The surgery itself takes very little time. They sit you down in a chair that is remarkably similar to a dentist's chair. They put anaesthetic drops in your eye and a speculum designed to keep your eyelid open. They have you continuously look at a small red light spot while they scrape away the epithileal layer and then sculpt the exposed cornea with the laser. In less than a minute it was over. I never felt a thing; the whole thing looked like a bizarre light show. Post-Op Care: This was the part that was not fun. The first weekend was pretty torturous. They gave me some pain killers to help the attendant pain that comes with having this procedure done, but they only helped a little. I was not looking forward to going through it again for the other eye three months later but I was so determined to have working eyes that the pain ultimately didn't matter to me. In the weeks that followed, I had the typical feeling that something was caught in my eye. This is only mildly irritating, but irritating nonetheless. During the three months following surgery I had to follow a strict regimen of eye drop treatment to regulate the healing process. If the cornea heals too much, then you end up undercorrected, and if the cornea heals too little, you end up overcorrected. The effect of these steroid drops are monitored by an optometrist to help determine whether to back off (for instance, from four times per day to three times per day) or to increase dosage. After three months, drops are no longer necessary and you should be seeing just fine with your new cornea. The complete healing process actually takes at least a year, but it is the first three months that really determine your results. During these first three months I had to wear my glasses with one lense removed. I had the optometrist make up a plastic lense to fill the empty space. This is inconvenient to be sure, but since my eyes were too dry to wear contact lenses, this was my only option. In September I went back to ME&E and had the second eye done. The first-weekend pain was much worse the second time, but I got through it all. The results were that I was about 20/20 in the right eye and about 20/30 in the left eye, with a small degree of astigmatism in both eyes. This was a vast improvement and while I was quite pleased, I was somewhat disappointed with having to live with astigmatism. Prior to this surgery I really didn't know what astigmatism was. Even though I had some in one of my eyes (I and my doctors suspect that the laser induced it in the second eye--a possible side-effect of refractive surgery), I never noticed it because my glasses adjusted for it and with my glasses off, my vision was so blurry that I never noticed the astigmatic effect. But now that I had nearly 20/20 vision in both eyes, the astigmatism really became clear, and it was annoying. And that's why I decided to go under the laser again two and a half years later, but this time the procedure I chose was LASIK. As mentioned elsewhere on my webpage, I moved to San Diego in March of 1998. Shortly after moving here I learned about a new refractive surgery technique called LASIK. In every way, it is superior to PRK, and in fact, there is probably little reason for any doctor to perform PRK anymore. � They can do both eyes at the same time. � Healing time is about one week, not three months. � There are no steroid drops to take for three months. � There is little or no pain after surgery. � Astigmatism can be treated at the same time as myopia. � The pre-op exam does not involve dilating your eyes. � Multiple "touch up" operations can be performed to fine-tune the results. The secret to how LASIK achieves all these benefits is simple: the procedure does not involve the scraping away of the epithileal layer and damaging the outer layer of the cornea called Bowman's Layer to get to the layer that actually needs sculpting. In PRK, the laser shoots straight through Bowman's Layer to get to the corneal layer underneath, and this is why the healing process is so painful and takes so long. Bowman's Layer takes months to heal, and if not properly treated with steroid drops, it can heal with scars and haze, ruining your vision. LASIK avoids all that by cutting a flap of tissue that includes the epithileal layer and Bowman's Layer, folding it back, and exposing the cornea directly to the laser. When the laser is done reshaping the cornea, this flap is folded back into place where the epithileal layer immediately begins to re-heal, and the best part is that Bowman's Layer was never traumatized by the laser! After some research, I decided to have it done at the Dr. Glen Kawesch's Laser and RK Center in La Jolla, only minutes from my apartment. Dr. Kawesch performs hundreds of these every month, and he has the latest technology, so I felt confident and comfortable with him. The cost was higher, and given the fact that I was essentially just enhancing the PRK, I wasn't sure I wanted to spend the money. But since LASIK so quick and simple a procedure, I decided that no amount of money was too much for perfect (or as near as possible) results. If I have to go back ten times, I will (if they will let me). 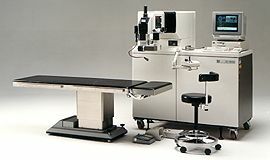 The cost per eye is $1950, and that is the same whether you are having PRK or LASIK performed. And even though my surgery was more-or-less just a "touch-up" of a previous procedure, I was a new patient for them and had to pay full price. Subsequent touch-ups with Dr. Kawesch are free if the initial surgery fails to give you 20/40 or better (legal driving vision), and $250 per eye if you can legally drive but you still want to fine-tune your results. To me, this is wonderful, because when I had the PRK performed I was told that touch-ups wouldn't be performed at all if I was corrected to 20/40 or better. My how a couple of years of technological progress can make a difference! A note about laser machines: There are a number of lasers approved for use in refractive surgery: the Summit, the Visx, and the Nidek. The Summit laser is the oldest, the Nidek is the newest. My PRK was performed with the Summit, and that had two important effects on my results: first, the Summit can not fix astigmatism, and second, the Summit only has a 6mm laser spot. This means that it can only correct an area of the cornea 6mm in diameter. My pupils expand to about 6.5mm in low-light conditions (like driving at night, for instance) and that means there is a 0.5mm "ring" of untreated cornea that I see through at night. This causes me to see halos around brighly lit objects (like streetlamps) at night. While not terribly noticible, it is nonetheless one more thing I'd wanted corrected if possible. Well, the Nidek can cover up to 9mm, and so using the Nidek I had that last 0.5mm of my cornea treated. Pre-Op Exam: The pre-operative exam was similar in intent to the one I had at ME&E back in Boston, but very different in actual practice. For one thing, it took half the time and they didn't have to dilate my eyes in order to get a corneal mapping for the laser. Again, like before, this was done on a Wednesday. Surgery: Surgery was on a Friday again, so I would have the weekend to recover. And again, I was given a Valium tablet to calm me down prior to the procedure.